Nudge coauthor Cass Sunstein and leading decision-making scholar Reid Hastie shed light on the specifics of why and how group decisions go wrong—and offer tactics and lessons to help leaders avoid the pitfalls and reach better outcomes. What Goes Wrong In Groupthink? Two heads are better than one, according to the old saying. So why are groups with lots of "heads" known for making bad decisions? Why does "groupthink" immediately connote ineffectiveness and mistakes? 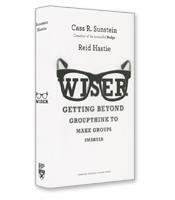 These questions are answered in a fascinating new book called Wiser: Getting Beyond Groupthink to Make Groups Smarter, written by Cass R. Sunstein, a former White House official, and Reid Hastie, an academic specialized in the psychology of decision making. Building on their combined experiences and research, Sunstein and Hastie dissect what goes wrong in group decision-making, then offer clear-cut solutions to overcome these problems. Group decision-making involves discussions among members of a group, each with their own skills, experience, ideas and information. Unfortunately, as the authors explain, there are two types of influences on group members — informational signals and social pressures — which skew the deliberations. Informational signals cause people to keep information to themselves when it contradicts information from others, especially leaders. Social pressures cause people to keep information to themselves to avoid punishment, for example, the disapproval of leaders who are contradicted. These influences lead to four problems, the authors write: Instead of correcting the errors of their members, groups actually amplify those errors (e.g., the leader’s mistaken conclusion is validated by the group); cascade effects take over when the group follows whomever spoke first or loudest; groups become more polarized, that is, more extreme in their sentiments, as the internal discussions reinforce their predisposed thoughts; and groups focus on shared information (what most people know) instead of unshared information — the information known only by a few individuals. Leaders have to keep quiet and convince group members that they sincerely want to hear all ideas. Group success (not individual success) should be rewarded. Group members must understand that if the group is right, everyone benefits; this will encourage them to ensure that they find the right answer rather than pushing their own ideas. Group members should be assigned specific roles (for example, one person is the medical expert, another the legal expert), thus ensuring that everyone contributes. Either individuals or assigned teams (known as red teams) should be tasked with acting as devil’s advocates. Groups also fail, the authors write, because they don’t distinguish between the “sloppy” early rounds of deliberations, in which all ideas must be allowed on the table, and the final rounds of deliberations, in which groups must be tight and analytical as they seek the precise solution. Successful groups will deliberately separate the two processes. In another approach, the authors demonstrate that the wisdom of crowds (making decisions based on the average or majority of large crowds of people) will often lead to the right answer if a majority of crowd members know their material. Decision-makers often prefer to rely on one single expert, but “chasing the expert” significantly reduces the probability of getting the decision right. Wiser is a quick, engaging and thoughtful read that compellingly argues that, with a few simple steps and open-minded leadership, group deliberations can, indeed, lead to wiser decisions.